The Style Socialite - A Fashion/Society Blog : A visit to Maggie Norris’s Couture Showroom + Exclusive Interview about her Fabergé Rosebud' Corseted Egg! This week I had chance to spend time with legendary Couture Designer, Maggie Norris at her exquisite showroom in New York. Maggie is a consummate artist; she is a fashion designer with a passion for collaboration with all types of artists. This passion has taken her to the very height of design, Haute Couture, a world where art and beauty meld into a dialogue of craft and expertise. Maggie Norris's custom-made creations have been worn by various celebrities and socialites, among whom are Nicole Kidman, Naomi Watts, Jennifer Aniston, Alicia Keys, Halle Berry, Sharon Stone, Beyoncé Knowles, Diane Keaton, Anna Getty, Somers Farkas and Michelle Obama. I met Maggie a year ago at a social event and have been following her work ever since. I was thrilled at the opportunity to visit her showroom and chat about her collaboration with Fabergé The Big Egg Hunt. The Fabergé Big Egg Hunt is an innovative and engaging fundraising initiative that will see over 250 large egg sculptures – each designed by globally renowned artists, designers and creatives - placed throughout New York City’s five boroughs from April 1st to April 26th, 2014 benefiting both Elephant Family and Studio in a School. Limited edition miniature eggs and other merchandise will be available for purchase at www.thebigegghunt.org. Maggie and I sat down over some coffee and chatted more about her egg for Fabergé The Big Egg Hunt. Your Fabergé Rosebud' Corseted Egg is exquisite and fit for a royal. Can you tell me about your inspiration for it? 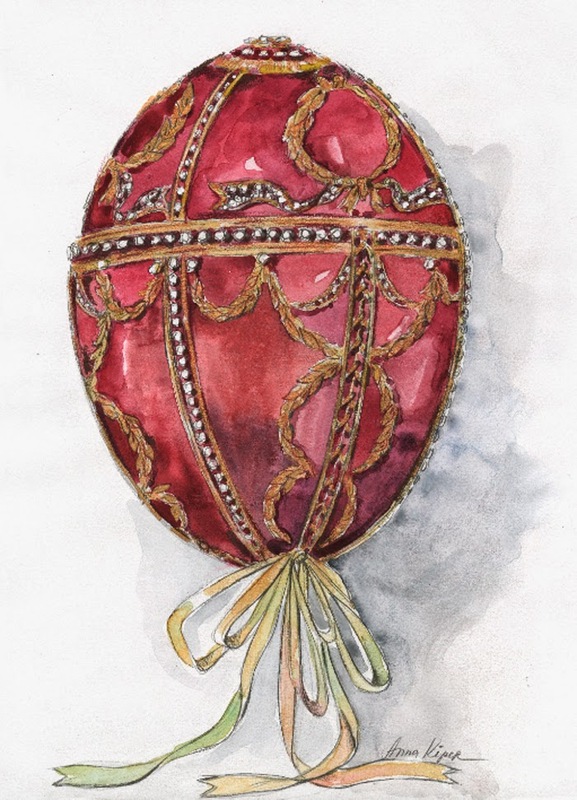 Maggie Norris: I was inspired by the Imperial Rosebud Egg by Peter Carl Fabergé. My egg, for The Fabergé Big Egg Hunt, is a reconstruction of both the Fabergé Imperial Rosebud Egg (1895) and my inspired 'Fabergé Rosebud' Corset. The Fabergé Imperial Rosebud Egg, presented in 1895 to the new Czarina Alexandra by Czar Nicholas II, was a representation of her life as the Empress of Russia. "The surprise inside was an enameled golden yellow rosebud, a symbol of the couple's love for one another. For Czarina Alexandra, the egg was also a reminder of her native country of Germany, where the golden yellow rose is the most prized color. Inside the rosebud was a tiny diamond-set Imperial crown, representing Alexandra's new life as the Empress of Russia. I also did a Russian collection. When Forbes had their gallery on 5th avenue they had a lot of eggs there and so I was really inspired to do a corset and that’s actually the corset. It was in the fashion show at the Russian Consulate. When they asked me to do the egg, first of all it was such an honor because they only asked 250 designers and artists to do it. I was trying to think of an idea and I don’t know if anyone has ever done a corseted egg so that was very exciting. It took a lot of time and effort to do it. We literally made a pattern for the egg just like it was a dress. What is your secret to making the perfect corset? Maggie Norris: A lot of it is sculpting and looking at the women’s body. And, also I am very inspired by architecture. What I love about the corset is that you can take a small amount of fabric and really make something beautiful. How long did it take you to design the egg? Maggie Norris: We worked on it for 6 months. The element just like any of these pieces is the fabric and making sure that’s available. Then sending it out to make the embroidery took around 2 months. It was a lot of work. What materials did you use to design the egg? Maggie Norris: Silk velvet, Swarovski crystals, gold bullion and the embroidery is Shameeza. Towards the end of the interview Maggie wanted to make sure that every person who helped in the creation of the egg receive the appropriate credit. The first person Maggie wanted to thank for helping with the egg was her assistant, Heather Sluyk. Then Maggie introduced me to seamstress Judith Lopez who also was very much involved in the egg's creation. Anna Kipper, Edelia Morejon, Maria Landau, Ashley Akcakanat, Adrienne Wells, Delia von Neuschatz, Shameeza Embroideries, Swarovski, Holland and Sherry, Tinsel Trading, Marc Joseph Salon NYC, Mario Gatti, Mike Stallone (Withum Smith + Brown), Barry Horowitz (Withum Smith + Brown). Check out the video of the creation of the Fabergé Rosebud' Corseted Egg below; followed by photos from Maggie's beautiful couture showroom.